After my debate in Maryland a few months ago, I had breakfast with Presbytera Frederica Mathews-Green who interviewed me about the debate. Presbytera Frederica is an author and speaker in the larger Orthodox world. You can see her website here. 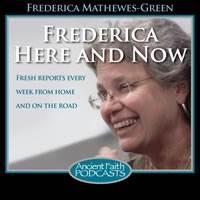 From Ancient Faith: Frederica Mathewes-Green interviews Fr. Hans Jacobse about a formal debate he had with atheist Matthew Dillahunty regarding morality. She also shares a recipe for vegan pancakes!